Q: It is the International Day against Drug Abuse and Illicit Trafficking today. Could you talk a little bit more about China's contribution to the international anti-drug cooperation? A: Indeed, today marks the International Day against Drug Abuse and Illicit Trafficking. In fact, since modern times, the Chinese people have been fighting a tenacious battle against drugs. The destruction of opium at Humen, Guangdong in 1839 was an event marking that China was the first country to launch a large-scale and state-level campaign to destroy drugs. 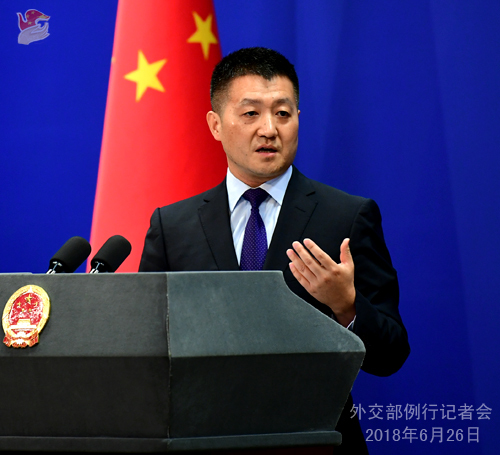 In today's world where the drug issue has become a global challenge, besides steadfastly combatting drug abuse and illicit trafficking on the domestic front, the Chinese government has been vigorously promoting and engaging in the international anti-drug cooperation on the basis of the Five Principles of Peaceful Co-existence. For instance, as a signatory to the relevant United Nations conventions against illicit drugs, China has deepened its cooperation with such international multilateral drug control institutions as the United Nations Commission on Narcotic Drugs and the United Nations Office on Drugs and Crime, conducted various anti-drug cooperation with relevant countries and signed bilateral anti-drug cooperation agreements with many countries. In the meantime, we have also been actively supporting and promoting sub-regional anti-drug cooperation, assisting neighboring countries in their efforts to combat drugs. China has also carried out various kinds of intelligence exchanges, training and law-enforcement cooperation in relation to drug control, delivering an effective blow to transnational drug trafficking. In commemoration of the International Day against Drug Abuse and Illicit Trafficking, I would like to reiterate that China will continue to step up its cooperation with other countries around the world and make unremitting efforts altogether to realize a drug-free world. Q: US Defense Secretary James Mattis has arrived in Beijing today. He is visiting obviously at a time of a lot of tensions between Beijing and Washington over such issues as the South China Sea and trade. Isn't it a positive signal that China is sending that it has invited him to come and he is indeed visiting at this very sensitive and difficult time in relations between China and the United States? A: Regarding US Defense Secretary Mattis' visit, the Spokesperson of China's Defense Ministry has already released relevant information and offered some details as well. As an important component of exchanges and cooperation between the two sides, China-US mil-to-mil exchange has been enhancing over a period of time. Defense Secretary Mattis' visit was agreed long before by the two sides. The two sides will exchange views on China-US relations, military ties and issues of mutual interest. You mentioned that China-US relations were at a sensitive and problematic time. You may all be thinking about our bilateral trade issues. Like we repeatedly said before, after 40 years of development since the establishment of diplomatic ties, the interests of China and the US are inextricably intertwined, and with growing exchanges and cooperation, China and the US are further exposed to each other. We believe it is all natural that bilateral ties may encounter some problems at different sectors during various periods. Regardless of all that, what is imperative is that China and the US should properly handle bilateral ties in the spirit of mutual respect, mutual understanding, expanding cooperation and controlling differences. We believe that as long as we continue to follow this spirit and meet each other halfway, there will be no insurmountable difficulties. Q: In a recent interview with AFP, leader of the Taiwan region Tsai Ing-wen said that the mainland was putting "immense pressure" on Taiwan and called on the international community to constrain China, saying that we need to work together to reaffirm our values on democracy and freedom in order to constrain China and also minimize "the expansion of hegemonic influence". I wonder if you have any reaction to that? A: As we said on many occasions, Taiwan is part of China. 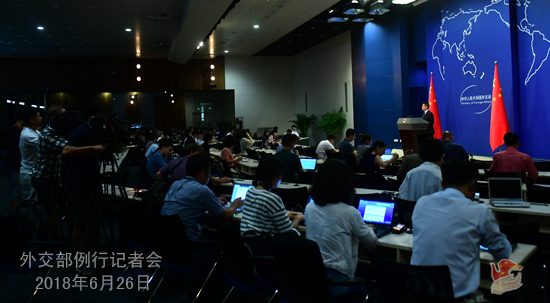 What was said by certain person in Taiwan falls within China's internal affairs, and we won't give specific reaction to that here at the Foreign Ministry. I would like to refer you to the competent department of the Chinese government that is in charge of the Taiwan affairs. I shall point out in principle that we hope certain people in Taiwan could correctly understand the development trend of China and its national unity as well as the evolvement of international circumstance and stop moving further down the wrong path. It won't work even if they try to bank on foreign forces to build themselves up. Q: According to reports, former Japanese Prime Minister Yasuo Fukuda laid a wreath at the Nanjing Massacre Memorial Hall the other day to pay tribute to the victims of the massacre. What is your comment? A: We have noted that former Japanese Prime Minister Yasuo Fukuda on June 24 visited the Nanjing Massacre Memorial Hall and laid a wreath in tribute to the victims. We appreciate all these peace-loving moves by people in Japan who choose to adopt a long-term vision and acknowledge history as it is. This year marks the 40th anniversary of the signing of the Treaty of Peace and Friendship between China and Japan. 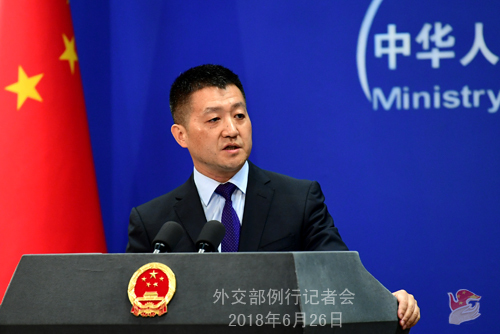 We hope Japan will earnestly revisit the spirit of the treaty, translate its positive attitude towards improving relations with China into concrete actions and work with China to consolidate the political foundation for our bilateral relations so that China-Japan relations could make steady steps forward along the track of peace, friendship and cooperation. Q: Over the last 24 hours, there have been very confusing signals that the US government has given out when it comes to trade. On minute people are saying that they are going to target specifically Chinese. The next minute they are saying that this is going to be more related to all countries around the world that the US might consider to be a threat. Is it very difficult for the Chinese government at the moment to try to work out what message is coming out from the United States, because one official says one thing and the next minute another official apparently contradicts him and says something else completely? A: I understand how you must have felt. But the policies of the US side can only be explained by the US government. As to how we perceive their policies and their mixed messages and how we formulate and move ahead with our policies including economic and trade ones in such circumstance, I believe that you are also aware of China's position on the current trajectory of the economic globalization, the issues arisen from globalization, and solutions to these issues. Our position is consistent and firm and will not be changed because of any single event at a particular time. We believe that problems accompanying development can only be resolved through further development, and issues brought along by globalization can only be addressed by making globalization more open, inclusive, universally beneficial, and balanced for win-win outcomes. In response to the strains and problems between major economies in the international economic sector, China shares the view with the vast majority of the international community that the current order and rules for international economy, trade and finance must be upheld and promoted, and we should remain committed to facilitating and liberalizing trade and investment. We believe that spells out the fundamental way to resolve the relevant issue.